Box Text: ENEMY CONFIRMED - LOCK ON! Strap into your cockpit and blast through the gut-wrenching world of flight combat. Your adrenaline pumps as machinegun fire pelts off your tail, you execute backbreaking barrel rolls and experience dog-fighting action. Take your pick of over 70 planes, including military fighters rendered from actual aircraft. With a full range of extreme missions to numb your senses, AirForce Delta Storm pushes your Xbox™ to the sky! 10-09-2015 Flashback2012 Box Text ENEMY CONFIRMED - LOCK ON! 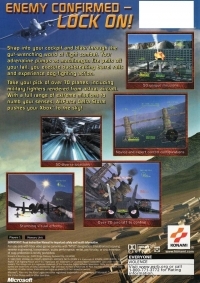 Strap into your cockpit and blast through the gut-wrenching world of flight combat. Your adrenaline pumps as machinegun fire pelts off your tail, you execute backbreaking barrel rolls and experience dog-fighting action. Take your pick of over 70 planes, including military fighters rendered from actual aircraft. With a full range of extreme missions to numb your senses, AirForce Delta Storm pushes your Xbox™ to the sky! 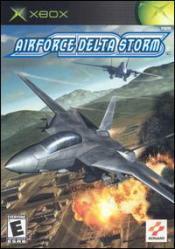 This is a list of VGCollect users who have AirForce Delta Storm in their Collection. This is a list of VGCollect users who have AirForce Delta Storm in their Sell List. This is a list of VGCollect users who have AirForce Delta Storm in their Wish List.